We also offer birthday parties for children. We offer riding lessons for both adults and children of all ages and abilities. Short pony rides out of the arena are available for children to get them out and enjoying the welsh countryside. Enthusiastic children will find a warm welcome on pony days when they can immerse themselves in the life of the stables and really get to know the horses and ponies. We also offer birthday parties for children. Tuition is offered either individually in a private lesson or as part of a group for both adults and children. Taylored to suit your requirements, the instructor will be chosen on your behalf, a good choice for a beginner or as a refresher is a half hour lesson followed by a half hour trek, it is a great way to get back in the saddle. Children’s lessons are both fun and formal, we want to see children smiling and not feel pressured when they are taught. They can be taught at which ever level they are at whether being only on lead rein and weaving in and out of cones or cantering and jumping a course of fences. In holiday periods we hold pony days, they are full days of stable management, fun and games and riding. Depending on the season we may hold Easter egg hunts, picnic rides, Halloween parties, jumping days, gymkhana and much more and even Father Christmas visits at Christmas! Children will need to bring their own lunch and suitable clothing for the day. Lots of fun suitable for all ages, rosettes are awarded at the end of each day as an achievement! Our pony rides are half hour rides on quiet ponies, children will be lead in the arena and around the quiet country lanes. There is no minimum age providing your child is well balanced and confident to hold on safely. Rides cost £15 with a rosette. New for 2018 we are offering a pony picnic experience. 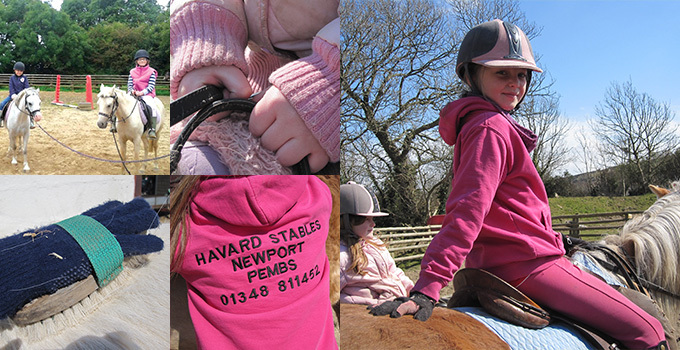 Ride a pony up towards the mountain to our beautiful view point of Newport and Dinas. Sit and enjoy a snack of welsh cakes, crisps and a drink (included in the price) whilst enjoying the view with your pony. Duration of ride half an hour with 15 minutes snack time. We can organise for children to celebrate their birthdays here with their friends, you are welcome to bring your own food and cake whilst we organise the ponies and games. Rosettes are given to all with a special one made individually for the birthday child. Cost would be depending on amount of children and length of time please contact us to discuss.